"This is wheely good stuff!" Some rally style alloy wheels are lighter – (less weight = more speed) and also are designed to increase the cooling of the brake discs. Some designs hold up better to being curbed than others and some break very easily when hitting a pothole or kerb at speed. Always go for the best quality alloy wheel that you can afford and read the reports and reviews. If you do go for a different overall size you must get the suspension and tracking realigned to avoid uneven wear under acceleration. 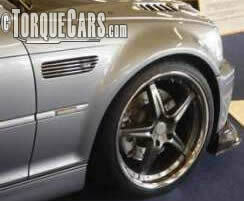 Our forum is a great place to go for tips and suggestions on choosing the best alloy wheels. Fact of life - ALLOY WHEELS GET KERBED. Choose a pattern that will not stick out too much and hit the curb (split rims are good for this). Look at the car from a distance to see if the wheels are at the correct vertical angle then get a friend to drive the car while you stand at the side of the road (not directly in front of him!) and see if the inside or outside of the wheels lift up under acceleration, cornering or braking. A lighter wheel will improve handling - less weight is rotating around the hub so components such as suspension and even brakes will last longer. The gaps in alloy wheels also aid brake cooling and allow the brakes to do a better job at slowing up the car. Big wheels look really cool but I have not found anyone yet who says that they have improved the ride or handling of their car. Keep the overall wheel width with tyre dimension as the OEM provided but go for a larger alloy and ultra low profile tyre if you really want the big wheel look. Lower profile tyres are noisier and due to their low flexing they give excellent handling characteristics. Wider alloys do not necessarily mean more grip, read our myth busting article on Performance wheels for more information on the technical aspects of a wheel and it's construction. Many users complain that taller wheels affect the speed and handling adversely and cause tram lining and bumpy rides. If you are contemplating alloy wheels try to keep the overall rotational diameter the same. If the rotational distance is larger (taller wheel size) then you will need to get your speedo recalibrated a 10% larger rotational diameter means that each mile you cover is 10% shorter and each mile per hour you are doing is 10% out. Use the calculator below to suggest alloy wheel and tyre sizes to match your existing rotational diameter. Bigger wheels are often heavier so you should compare the weights of alloy wheels with the standard wheels you have. A rotating wheel will have a gyroscope effect and resist a change of direction so handling can be slightly affected with different wheels. Low profile tyres also increase grip, but the ride is harder and the tyres are more expensive. Some alloys are designed to be light weight (they can snap more easily though) and have a pattern that increases the airflow to the brake discs aiding your breaking efficiency. When you buy an alloy you need to check the pattern of nuts matches your car (Obviously!) PCD, you also need to check the offset and bore measurements. The last thing you want is the wheel not fitting properly over your brake discs or a wheel that grinds into the arches when you hit a bump or turn a corner. You may need to get your arches rolled or cut. Anything other than the original rotational dimensions will definitely require suspension adjustments. You should always get your camber, toe in/out and other suspension components checked for alignment when you change tyres, alloys, or hit a curb or bump that jolts the car. Fact of life - ALLOY WHEELS GET KERBED. Choose a pattern that will not stick out too much and hit the curb (split rims are good for this). If the alloys have a chrome finish they can cost a fortune to get refurbished but look dreadful when scratched. Summary: Keep the rotational diameter the same. Buy alloys for performance based on weight and brake cooling. Buy alloys for aesthetics based on their longevity and try to get an alloy pattern that will curb gracefully. If the difference in circumference is 15% bigger your speedo will be 15% out as well. The aim is to keep the rolling radius as close as possible. Not all tyre sizes exist or are practical - we recommend that you check with a tyre retailer before ordering your rims. This entry was filed under Handling, Tuning, Wheels & Tyres. You can leave a response below or join our forum to discuss this article and car modification in detail with our members. What is “PCD”? Also, total wheel diameter lowers speedo/odometer readings and, thus, lowers speed/distance shown compared with the truth? That could be made clearer. I also noticed that the Suzuki Swift (2005-10) originally had 2 wheel choices: 175/65/14 & 185/60/15, but these have a 62.5mm circumference difference, which is well beyond your 40mm recommended limit. Can this be explained? Also, does a larger diameter/circumference increase/decrease acceleration/top speed/power (torque? )/fuel economy? Thanks, very useful guide. PCD (BCD) = Pitch (Bolt) Circle Diameter, referring to the wheel nuts. I also worked out that the 60mm circ.diff between the 14″ and 15″ Swift (2005-10) wheels/tyres is probably due them not being optional wheels. Anyway, what about increased aquaplaning and a more sudden loss of traction (‘less progressive breakaway’) attributed to wider tyres? Cool.. i have one question. I want to change my Car Wheels to Alloys and i am not able to get 98 PCD Alloys easily. I have visited many of them, but, they say that they will change 100 PCD to 98 PCD and fix it to Car. Does this affect performance and what is the result of High speeds over 100 or 120? Sand that sounds a bit dodgy but they may be able to re drill your pcd away from the existing holes BUT would suggest you confirm that it is ok to do so from the wheel maker preferably in writing for your records.